The Avocado mattress is one of the most premium natural hybrid mattresses on the market. This sleep product is taking the durable, core support of a heavy duty coil system. And than pairs it with 3″ of premium Dunlop latex foam. Creating an 11 inch mattress that offers great pressure relief, a perfectly responsive feel and natural materials. This comfortable and supportive mattress even offers an upgrade. You can add an extra 2″ latex pillow top for an even plusher 5″ total of latex for a more contouring feel. All covered in a premium organic cotton cover with wool batting. Providing a soft comfort layer for minimizing pressure points as well as naturally moisture wicking and breathable layer too. 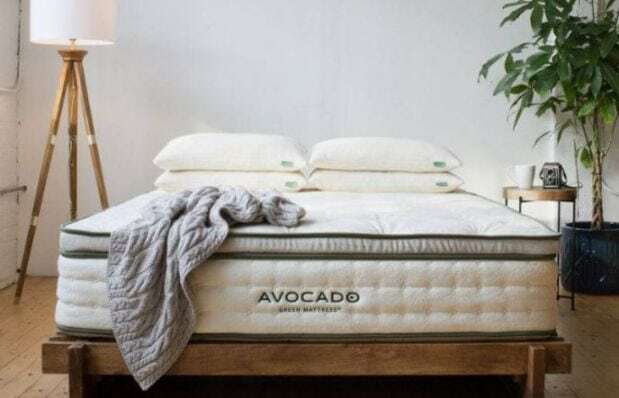 The main focus of Avocado is to create natural mattresses that are not only comfortable but very eco-friendly and non-hazardous or toxic to the sleeper. This sleep mattress has taken so many steps to being green that it is even GREENGUARD Gold Certified. Each material is meticulously chosen and the craftsmanship is superior. The mattress is also handmade in the USA and passes all the strictest standards. The Avocado Green mattress is well worth every penny of its great price point. This high quality, durable natural latex hybrid bed also comes with free shipping. It can also be upgraded to a white glove delivery service too. It comes with a 100 night sleep trial and a whopping 25 year warranty providing lots of value for money. This mattress is perfect for the naturalist who wants quality rest. Or any sleeper who wants a premium product and a wonderful value. The Avocado mattress is as green as a perfectly ripe avocado and makes for a unique one of a kind premium mattress. Also find out more about this luxurious green bed and save with the latest coupon at avocadogreenmattress.com. Below we have our comprehensive and detailed Avocado mattress review. We will go through how it performs for off gassing, comfort, motion transfer, sleeping cool, edge support, value, materials, trial period and warranty. With the Avocado Mattress you will have two delivery choices. You can opt to have it shipped for free by being roll packed and compressed into a box sent via Fed-Ex. Otherwise, for an additional $99 you can choose to have the mattress delivered and set-up through a white glove delivery service. It is nice to have the choice for these mattress sizes because this mattress is going to weigh a lot. About 96 lbs for the 11″ queen size and 130 lbs for 13″ queen size. This box that is comes in will be heavy and will take two people to maneuver. If you aren’t feeling up to carrying and setting this up, it’s as easy as requesting to have someone else do it for you. Either way, this mattress will have very minimal, if any at all, off gassing odor. 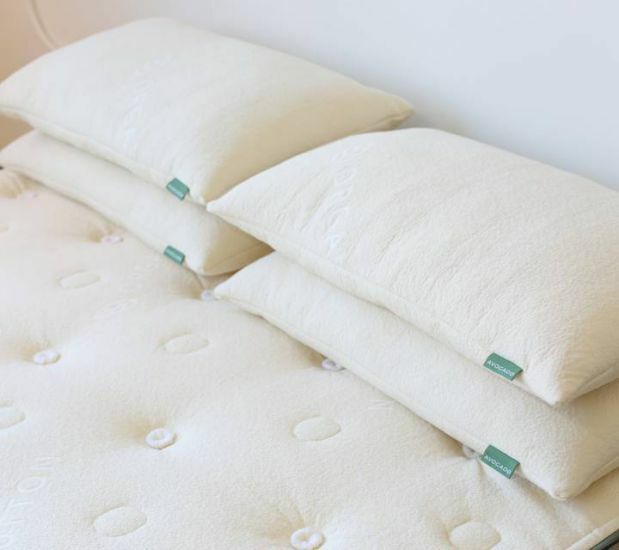 This mattress is made out of a natural latex and organic cotton and wool cover. So their might be a bit of a natural fragrance, but nothing noxious. Avocado is very adamant about using only non-toxic, eco friendly materials from top to bottom. Making off gassing no problem with this GREENGUARD GOLD certified mattress. The choices for this mattress continue with your comfort preference and ideal firmness. The Avocado Green mattress has a standard option that is 11 inches thick. This bed has 3″ of Dunlop latex on the top over a solid, durable coil system. The standard mattress is going to have a gentle medium firm feel that will be around a 6.5 to 7 on a scale of 1 through 10, 1 being the softest and 10 the firmest. This bed will have a balanced feel that provides great support with just enough plushness to contour to your body. The 11″ Avocado will be best for stomach sleepers and back sleepers who like a more solid feel. You also have the choice of upgrading the standard option for $400 with a 2″ thick Dunlop latex pillow top. This option will have a total of 5″ of Dunlop latex over the coil system and will have a more luxury-plush feel. This will fall more around a 5.5 to 6 on the 1-10 firmness scale. The upgraded mattress will not only be a little softer but also thicker overall at 13″. This Avocado bed will be best for side sleepers, back sleepers who like a little added softness and anyone who likes a more luxurious feel or needs added pressure relief. This mattress would also be a great option for a heavier person too. Since it uses very thick, dense materials that are not only durable, but also maintain their ideal feel and comfort for the life of the mattress. It also has a solid, durable coil system that will provide the necessary support much like a traditional spring mattresses would. The Avocado mattress is made of heavy, dense Dunlop latex as well as individually wrapped ergonomic support coils. This mattress may have a bit more spring than several other all foam or memory foam mattresses because of the natural buoyancy of its materials. However, using the pocketed coils that are each wrapped in fabric help reduce any motion in the coil system. Also, using Dunlop latex instead of Talalay will make for a denser latex that will absorb more vibration and soften any movements being felt. This mattress will be easy to move on, but shouldn’t make for much for partner disruption. This is why the Avocado mattress is one of the best mattresses for couples. The materials in the Avocado Green Mattress make it ideal for warmer sleepers who want a cooling mattress. This bed uses a coil system for the support and base of this bed. A mattress with a coil system is always a plus for a warmer sleeper because it allows for plenty of air to flow and any heat that is retained to easily dissipate. Having a place for built-up heat to escape is key in maintaining an ideal temperature while sleeping. 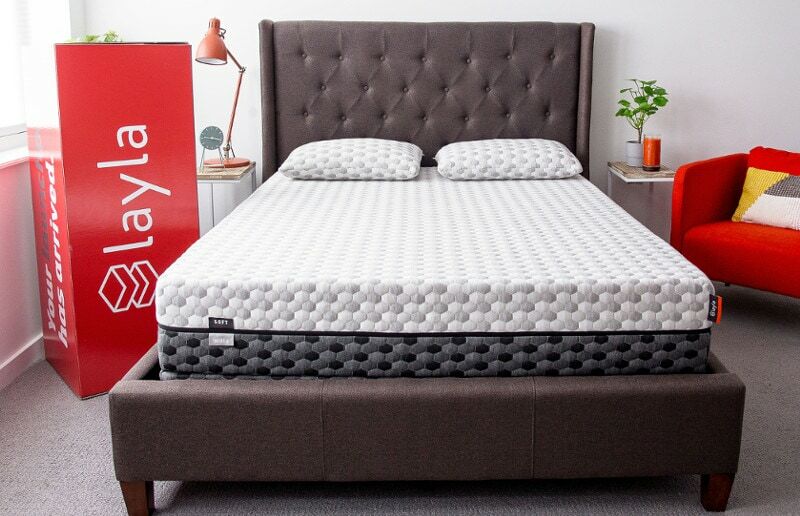 This mattress also uses only Dunlop latex as the only comfort foam over the coil system. Latex is great for warmer sleepers because it is naturally aerated as well as more responsive. This allows for sleepers to not feel stuck in the mattress and easily change sleeping positions. The easier it is to move the less likely you are to stay in a warm, cocooned heat retaining sleeping position. Lastly, the cover on the Avocado mattress uses a soft, breathable organic cotton that allows for plenty of air flow. This is layered over a quilted pad of naturally moisture wicking Joma wool. Wool is also anti-microbial, dust mite resistant as well as naturally fire resistant and temperature controlling. All of these attributes make for a truly exceptional mattress that will keep you comfortable in every aspect. The edge support of the Avocado is reinforced around the perimeter with thicker gauge steel coils. This creates a more sturdy edge that will allow the full surface of the mattress to be utilized.. 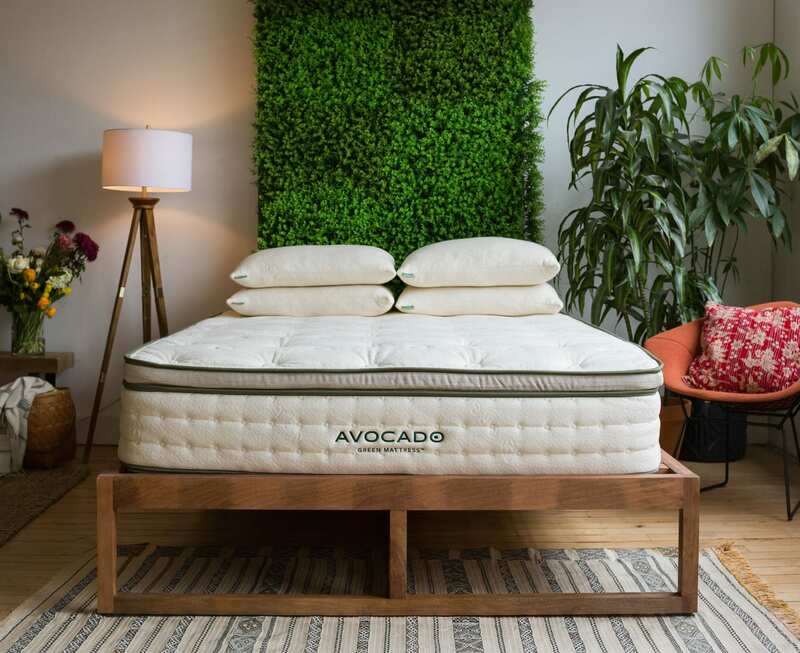 The 11″ standard Avocado mattress comes in at $1399 for a queen size, while the upgraded 13″ bed will be $1799 for a queen size. This pricing doesn’t even include the latest coupon making them more affordable. Included is free drop shipping and 100 night sleep trial as well as a 25 year warranty. 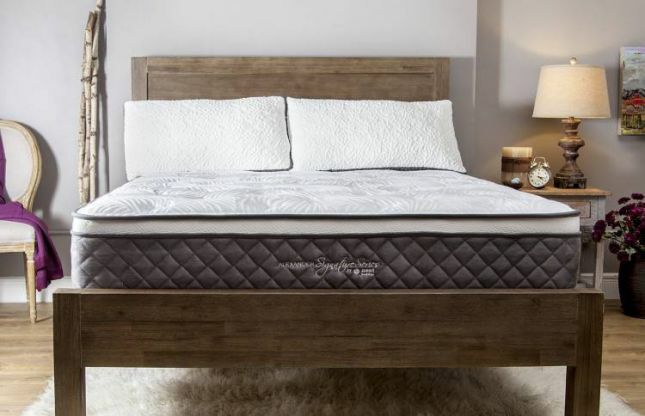 We feel that when you combine top of the line materials, with quality construction and benefits that help you get a wonderful night sleep that this is a great value along with the perfect mattress sizes for you. We do want to note that you also have the option to upgrade to white glove delivery for $99, but it is definitely worth it. Having it expertly handled by someone else is worth the small fee. The materials of the Avocado mattress utilize the natural comfort of latex foam paired with a durable and robust coil system. Topped off with natural wool and an organic cotton cover to make this mattress a truly luxurious and healthy mattress. The Avocado Green Mattress comes in two thickness options, 11 inches and 13 inches. Though they vary in thickness the materials are mostly the same. With the exception of a thicker and thinner layer of Dunlop latex. The base of this mattress uses a 8″ coil system and then is topped with either a 3″ or 5″ layer of Dunlop latex. This combination is very supportive and responsively pressure reliving. Making it great for every sleeper and size. And the option of latex thickness makes this mattress more accommodating to any sleeping style. 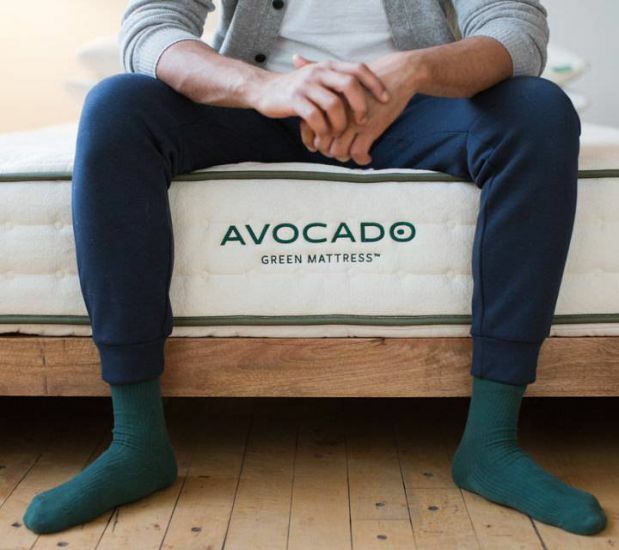 The Avocado Green mattress is topped with a thick layer of wool and a breathable cotton cover. Adding just enough plushness, naturally moisture wicking and temperature neutral for comfortable sleep all night long. Making this mattress a premium option that is also a great natural bed. You can also take it a step further and opt for the Avocado vegan mattress. This recent addition uses the same core and even the same organic cotton cover. However, instead of wool you get a organic cotton batting to ensure no animal based material is ever used. 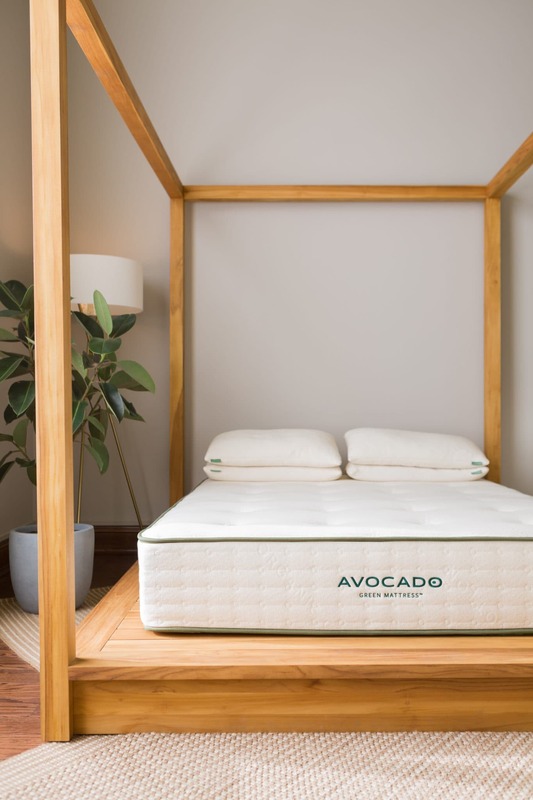 Learn more about this new Avocado Vegan mattress option at AvocadoGreenMattress.com. If you aren’t totally loving your new cooling mattress, no big deal. The Avocado mattress has a 100 night sleep trial period. Allowing you to try and test the mattress for over 3 months. This should allow for plenty of time to allow your body to adjust to the new comfort and support. And after that time if it isn’t working out Avocado will work with you to remedy this. By returning and fully refunding your mattress. Giving you peace of mind when trying it out. This mattress also has a 25 year warranty. This is above and beyond most online mattress warranties but not uncommon for a mattress of this quality and materials. It shows that Avocado truly stand behind their mattress. Especially if they are willing to go the extra mile on the warranty to ensure its value for the life of the bed. If you are looking for more specifics for the Avocado Green warranty find out more at avocadogreenmattress.com or for a helpful tool check out Our Mattress Warranty & Trial Period Guide. See all the great feedback so many sleepers have shared about their Avocado Mattress experience! “We got a king with pillow top. It is firm yet very comfortable with the pillow top. I normally sleep on my side, but sometimes roll over on my back during the night. I have lost my morning backache, which I would get with the old mattress no matter what position I slept. Also, I previously would get head congestion within 5 minutes on my old mattress–that is all gone. I sleep well and breathe clearly. Great product!”” – Courtney B. “I absolutely love this mattress! I have never experienced this degree of comfort from a mattress before. It took me several months of researching and reading every review before I made the decision to buy an Avocado! I am so glad I did! It’s been a life changer.” – Nancy M.
“Way cooler than our old foam mattress. 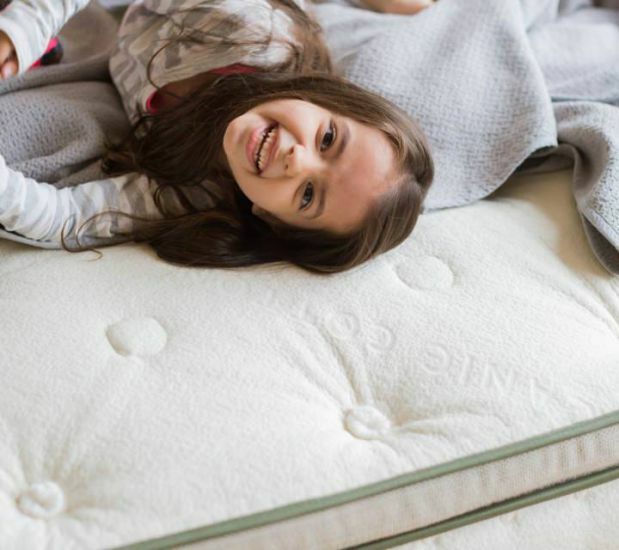 Love the bounce – feels like sleeping on a cloud.” – Carrie K.
Also, remember Our Sleep Guide is here to help and make sure you find the best mattress type for you! If you have questions or need more insight during your mattress buying journey, please feel free to contact us. The Avocado Mattress is a green bed in every aspect. However, these top quality and sustainable efforts haven’t compromised the comfort or support of this high quality premium latex hybrid mattress. If you want a bed that is contouring yet responsive and has durable long lasting support, the Avocado Mattress may be for you. Buy Your Avocado Mattress Review Mattress Here Latest Avocado Coupon! You want your mattress to have eco friendly materials that are safe and natural and a company that stands behind this philosophy as well. Still looking for some more information? Visit Avocado at avocadogreenmattress.com. Also, have questions for us? Please contact us and we would be happy to help you!